Home Sales In Killearn Estates Show "Size Matters"
Home sales in Killearn Estates have slowed from the rebounding pace that occurred in 2010, and home values continue to decline. Home sellers who listened to good advice got their home sold this year, while those that did not remain on the market and hoping for values that will not come. Currently, there are 72 homes for sale in Killearn Estates in the Tallahassee MLS, and we know of many more that have tried to sell in the recent past that most likely will be re-entering the housing market next year. As we study recent home sales in Killearn Estates, we find results similar to our recent real estate appreciation case study of the 32312 zip code. The average selling price of a home sold in Killearn Estates is on the rise, even as home values continue to fall. Buyers are simply choosing to purchase the larger homes, sending a signal that low interest rates are allowing them to spend more, but they are still very choosy and value conscious when the buy. 2011 home sales in Killearn Estates have seen an average price increase of 5% over those that sold last year. On the surface, this might appear to be good news if you need to sell a home in Killearn Estates, but our further graphs show that the average home sales price graph is more a sign of what buyers are prepared to spend, rather than what homes are worth. 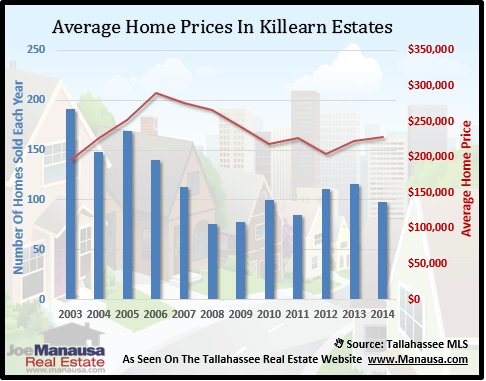 When we look at recent home sales in Killearn Estates and plot the average price per square foot, we get a better view of the real estate depreciation that is still occurring in all of the Tallahassee real estate market. 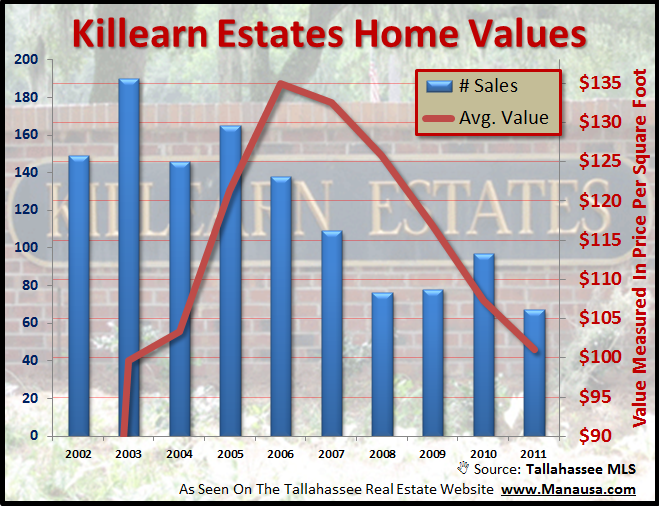 In the real estate graph below, we see that home values in Killearn Estates have declined 6% thus far in 2011, and that the rise in average prices that we saw above must be based upon something other than home values. 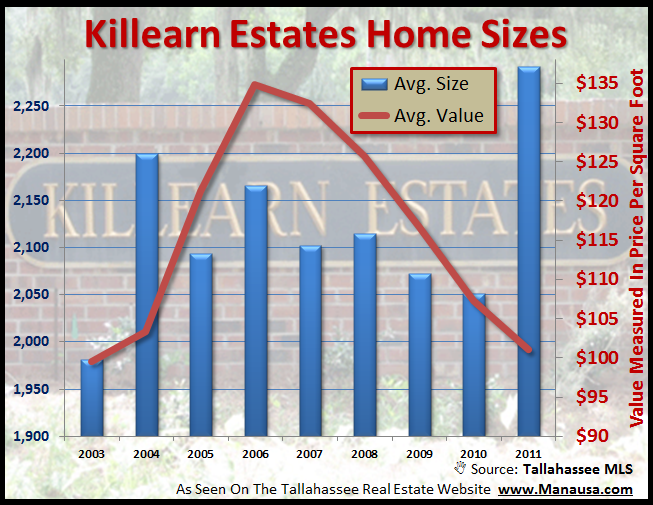 The final graph shows the average size of homes sold each year in Killearn Estates. The tremendous rise in the size of homes that are selling is clearly seen below, and it is the reason that the average sales price is higher even when values are declining. Home buyers have great opportunities in our market, and low interest rates are making for super purchases with very low monthly payments. This means that many are choosing to "buy bigger," without having to spend more than they want. If you own a home in Killearn Estates and want advice on what you can get, just drop me a note and we can schedule a time to review all of your options, as well as the real market data that will show you an anticipated selling price. Remember, home values are declining, and our supply levels indicate that this trend will continue for quite some time. Take action today by either choosing to sell your home right away, or by choosing to hold on to your home for five or more years to allow the market to rebound to higher prices. The following is a list of all homes sold in Killearn Estates (recorded in the Tallahassee MLS). I hope you were able to learn something from this Killearn Estates Home Sales Report, please drop me a note if you have any other questions or concerns that I can help you with.